Welcome to my review of Cash Grab by Jamie Lewis. What are his secret money making methods that he is going to reveal to us? What is this calculator that allows us to choose from over 50 business models? What else can we find inside this revolutionary product that we can make a ton of money with? I will answer these and more, in my honest, unbiased and in-depth Cash Grab review. If he sounds pompous to you, you’re definitely not the only one who feels this way. So let’s dive right in to see if these grandeur claims can live up to their expectations. Product type: calculator that identifies your business model out of 50+, based on time allocated and required earnings. Jamie Lewis is a serial product launcher, and a slick marketer, who knows how to sell his way through an unsuspecting audience. Cash Grab is nothing more than a useless calculator that chooses your business model based on how much you want to make and the time you can allocate to the business. It does come with some training, but you will never get started properly with any model just based on it. 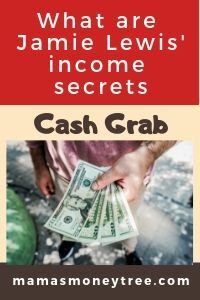 Read on for the detailed review of Cash Grab by Jamie Lewis, and why I do not recommend it. To find out what is Cash Grab by Jamie Lewis, let’s first take a look at the information presented in its sales video and landing page. I’m actually starting to enjoy doing reviews on Jamie Lewis’ products, because I can get a good laugh from all his dramatisation. I used to be seriously irritated watching him ‘perform’. 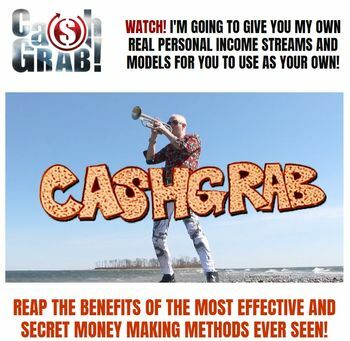 Anyway, in his Cash Grab video, he goes on his usual pitch about how he doesn’t want you to miss out on this money making opportunity, how he has been making so much money all these years so easily, and now he’s going to show you the secret methods, such that it’s impossible for you to lose. He introduces this calculator that groups 50+ business models based on skill level. So you can choose to go from the easiest level, and scale things up as you start to make money. Basically you just have to climb up the ladder of wealth. 2 hours of preparation time to get you $1000 a month? 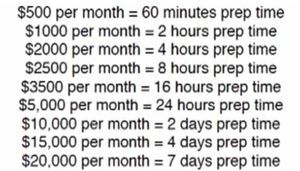 Prepare for 4 days to earn $15,000 a month? Now do you believe me when I talked about his pompous claims? So this founder of Cash Grab (yeah, that’s what he calls himself, founder, CEO, whatever, for every single product he creates and that lasts a few months through the launch hype because none of them ever works) promises that you will learn to siphon commissions off the internet once you buy this product. Guess what are those secret business models he has been talking about? They are in fact just stuff like freelance writer, affiliate marketer, domain flipper, etc. Nothing you do not already know. And all those earnings that he keeps showing on his phone, do you think he made those money by taking on these ‘business models’? No! He made those money by being a serial product launcher, creating and launching products every few months, stuff that promise the moon but will never deliver because this is just not how the world works. His more recent products include Bank Ramp, Profit365, Wealthy Agency, and Profit Injector. One thing is for sure: he’s a highly successful internet marketer, these products do make him tons of money, but they will never make any money for the people who buy into them. Jamie himself has never used any of these methods to get rich. You would expect that after the Cash Grab calculator chooses the business model, there should be some training or relevant information to get you started on that business track? All you get is the startup cost, skill level required, and some possible platforms where you can find that kind of work, for instance some agency websites. Well, you do get some very general video training on mindset and time management, which are of course important, but I expected something a lot more solid and action-oriented than that. This is nothing that can even get you started in whichever business model that’s recommended to you. There is more: you do get copies of sample emails and advertisements that you can use for outsourcing certain jobs to other people, as well as email copies that you can send to your mailing list as an ‘affiliate marketer’, and stuff like that, which are peripheral and in my opinion, just randomly thrown in to make it look like you’re getting a lot of value in Cash Grab. It certainly does a great job of adding confusion to a beginner who is just starting out trying to make some money on the internet. It gives you more possibilities than what you have ever thought of, without any substantial information that can help you make a wise decision. The calculator works on totally unrealistic figures when it comes to time put into the business and expected earnings. Chuck this useless thing aside. I want to show you a proven business model that has worked for countless internet marketers, making them a full time income and much more. In fact, it is one of the 50+ models in Cash Grab, but it never even goes near to teaching you how to start on it, much less the entire process of running it properly. What I want to show you is this business model called affiliate marketing. It is exactly how I am making my online income right now, working full time from home. It is a simple model. Basically, you promote other people’s products. And when customers purchase the products through your affiliate links, you get to earn a commission. It is a neat way to make money, because no physical products pass through your hands. In fact, you are not even involved in the sales transactions, which take place directly between the customers and the retailers. Which means you do not need to handle any customer complaints or refunds, or deal with any inventory, delivery, or own any products. Affiliate marketing is a lucrative business, because everyone is bringing their shopping online. The earning potential is huge. But not everyone who tries affiliate marketing is successful, because too often, they use paid advertisements to get traffic to their affiliate offers. Dabbling in paid traffic is not recommended especially for beginners, because it is an art and science that takes time and lots of money to master. If you do not know what you are doing, you can end up much deeper in debt than before you started. Now, I want to show you how I do affiliate marketing, using free traffic. I do not spend a single cent on getting traffic to my affiliate offers, and yet the free traffic I get is of the highest quality, that is highly targeted to convert into buyers at my offers. Jamie Lewis is a real person, that’s for sure. So we know he is at least willing to take accountability for his own product. For whatever reason that you may want it, you do get a calculator that does what it does: recommend some business models that you can possibly take on, given your expected earnings and time that you can allocate to the business. Besides not being of any use at all, I think Cash Grab adds to the noise that is already all over the internet. It totally doesn’t help a newbie, standing among the chaos and not able to quite figure out the right path to take. This guy is well known on the internet marketing space for launching products every few weeks or months. You can check out his previous products. They are all over the place, each product being very different from the rest. It shows that he is no expert in anything that he is trying to teach in his products. He is highly successful though, as an internet marketer. That doesn’t mean his products are any good to you, especially if he is not about to properly and seriously impart some skills and knowledge to beginners, and is only interested in making their money. As with any other product that is out to dig deep into your pocket, Cash Grab is no different. Right after you purchase the front end product, even before you get a chance to try it out and see if it works for you, you are going to get bombarded by these pricey upsells. Upsell 1: $297 – VIP Resource Mine, which is a very expensive resource vault of Jamie’s email copies and Google ad campaigns that have been proven to convert. Upsell 2: $197 – Live Coaching, access to Jamie’s monthly webinars. Is Cash Grab by Jamie Lewis Scam or legit? It is a legitimate calculator that presents the business models most suited to the time you can allocate, and the earnings you want out of the business. I do not recommend Cash Grab. It will not help you in your quest to make money online. If you really want to make some serious online income, there are many methods, but they all take time and hard work. I can show you what I think is the best method, because it is the exact method that I am using right now. But you have to stop searching for shiny objects, because if making money online were so easy, everyone would be millionaires by now. The way to find success on the internet is to follow a proven path that has brought many people to great wealth before you. Once you are sure that path is what you want to take, then find proper training, implement what you learn, and keep at it for as long as you need to see success. That is the secret. Which is in fact no secret. Because not many people can stick with something without seeing results fast, so they hop from one project to another, always failing and thinking that they just have to find the right formula that works. And they end up disillusioned, so give up on the internet, and go back to their 9 to 5 job. I can show you an entire community on a training platform for affiliate marketing, where everyone is working hard building up their own online business, knowing it works because they see real success stories from real people in there. If you have any concerns or questions regarding this Cash Grab review, do comment below, and we will start a conversation from there.